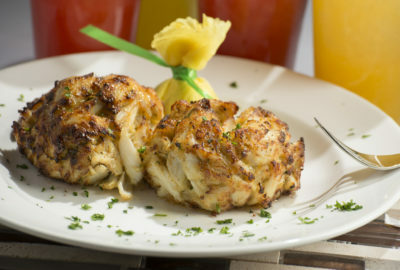 Since 1974, Jimmy’s Famous Seafood has been recognized as the premier restaurant of the Maryland delicacy known as the Crab Cake. We use only the finest ingredients from our homemade recipe handed down from generation to generation. Jimmy’s Famous Seafood is proud to offer its sensational, mouth-watering Colossal Crab Cakes to all of our fans across the United States. Mixed greens, feta cheese, Kalamata olives, pepperoncinis, red onions, cucumbers, tomatoes and peppers. Served with house dressing. Breaded chicken breast, smothered with our famous crab dip on a Brioche roll with pickles and fries. Jumbo shrimp tossed with mayo, celery and old bay on a Brioche roll with fries. Hand Breaded Cod, deep fried and served on a Brioche Roll with fries.